Authorize FlyData on Amazon Redshift – FlyData Inc.
First, you will need to provide information to FlyData regarding your Amazon Redshift account for the two systems to be able to interact. This will require you also to change the security settings on Amazon Redshift to authorize FlyData. This is particularly necessary for FlyData to be able to upload data to your Amazon Redshift cluster. The IP addresses shown on FlyData Settings will be used to connect to your cluster. You will have to provide these IP addresses so that FlyData’s servers can access to your cluster’s endpoint. How this is set, though, depends on whether you’re using Amazon’s Virtual Private Cloud. You can accomplish this by doing one of the following, whichever one applies to your situation. The type is the same for both rules. For the port range, you would use your Amazon Redshift Cluster (e.g., 5439). For the source enter the first IP address for the first rule and the second address for the second rule. When you’re finished, click Save. That’s all you need to do at this stage to authorize FlyData access to your cluster. Skip to the section below called, Preparing MySQL. 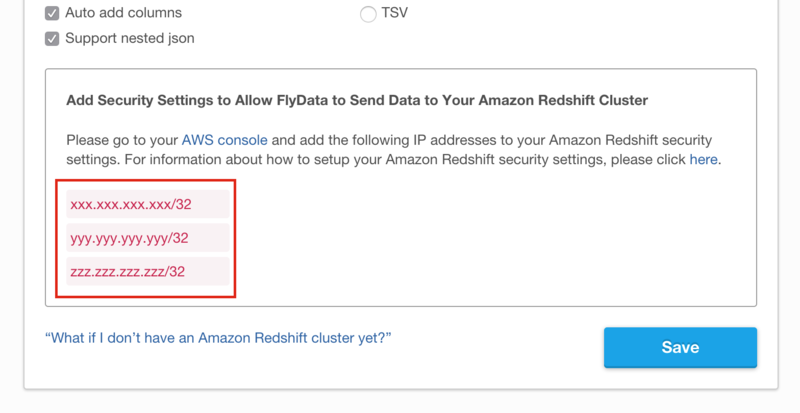 If you’re not using Amazon’s Virtual Private Cloud, you will still need to register FlyData’s IP addresses with Amazon Redshift. To do this, go to your Amazon Redshift Cluster AWS Console page, and click on the Security Groups table. Then select the security group specified as the Cluster Security Groups. At this point you will be able to enter the needed parameters (see screenshot below). That’s all you need to do at this stage to grant FlyData access to your Amazon Redshift cluster.